According to research published by Radicati Group Inc., “More than 2005 billion emails were sent per day in 2015”. We usually spend a lot of time every day to manage our emails in Outlook. Some email management tasks are performed regularly, repetitively in Outlook. Quick Steps is a useful feature in Microsoft Outlook that allow you to perform multiple actions at the same time to email messages. 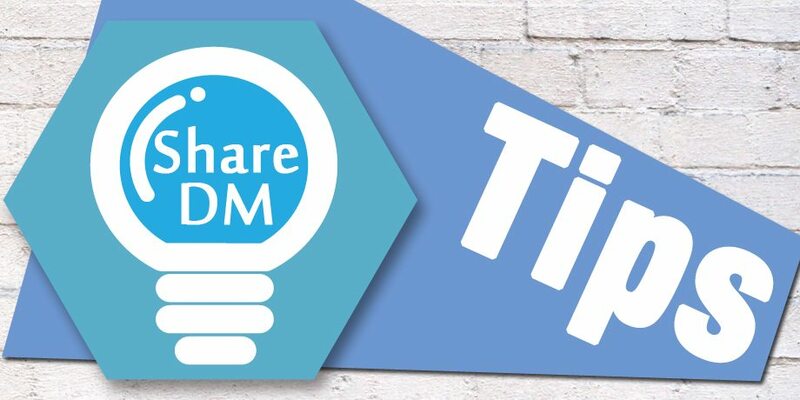 For example, you may frequently move emails to specific folder and mark it as read at the same time, you can use a Quick Step to do these two tasks in one click. Quick Steps are found under the “Home” tab in Outlook. Click the arrow in the lower right corner of the Quick Steps to open the Manage Quick Steps dialog box. A set of basic tasks generally performed are provided for you in the Quick Steps group of the Home tab. Or, you may click on the button to set up your own Quick Steps. Click “New” and select an action, we choose “Move to Folder” in this example. Choose the folder you are frequently moving email messages to. 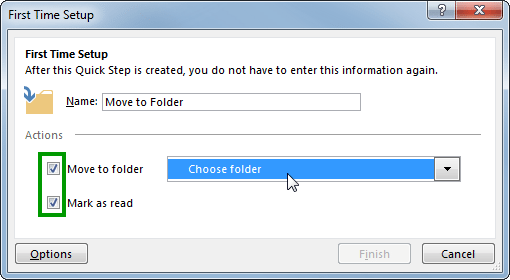 Remember to check the checkbox of “Move to folder” and Mark as read. Then click “Finish” and “OK” to close the dialog box. 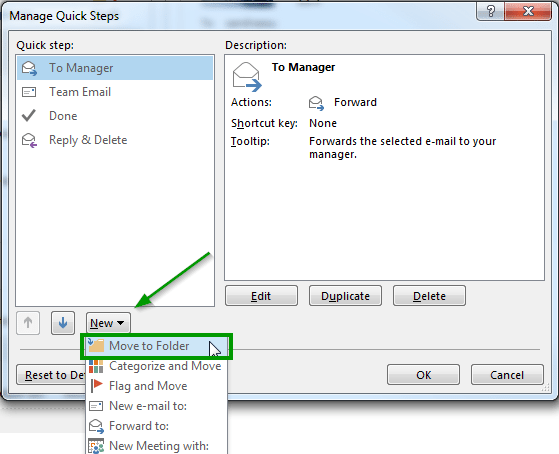 Once your Quick Step is created, you can move the message to specific folder and mark it as read in one click. Try now and save your time in managing your mailbox with this useful Quick Steps!